Garrison Woods (CFB Lincoln Park) - This community is often described in Calgary real estate ads as beautiful, charming, "sought after", old-fashioned and quiet upscale neighbourhood. It is quite small as well, with less than 1500 residents. Descriptions includes the names Garrison Green and CFB Lincoln Park. 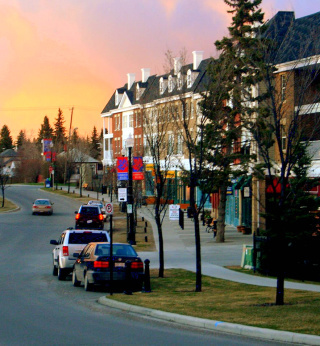 Garrison Woods, close to Mount Royal University, has user-friendly public transportation service and access to downtown and west hills shopping, the bike paths and Glenmore Park. Other stunning parks include the Flanders Park and Garrison Square with its monuments. This community, shown by the #1 in the map below, lies south of Mount Royal Gate, east of Richard Road, north of Glenmore Trail and West of Crowchild Trail. Some of the residential developments include parcels just east of Crowchild Trail as well. Other delightful things here include three golf courses in the area, Glenmore Reservoir and 17th Avenue close by, an arena in the community, good access to the Rockyview Hospital, Catholic and public schools for all grades including charter schools are all nearby. The Calgary Board of Education lists the Sir James Lougheed School, Glamorgan School, A.E. Cross School and Central Memorial High School as primary choices serving the area. See the Calgary High Schools page for high school locations. For the Catholic kids there is Holy Name School, St. James Junior High School, St. Mary's, St Michael and Bishop Carroll High School. If you attend U of C or SAIT, Crowhild trail takes you most of the way there. The neighbourhood can also boast about having Calgary's absolutely lowest crime rate. Hands down! This makes for a safe, friendly place where neighbours are encouraged to gather in their front yard and feel secure in each others' presence. They pride themselves in decent lighting and streets designed to reduce traffic and vehicle speeds. This Garrison community was once part of the old CFB in town and much of that character is preserved. This area now occupies the former PMQ's, private married quarters servicing the military base until 1998. Many large mature trees remain on site after redevelopment. The architecture reminds us of simpler times as well. People are glad to pay a premium for modern living spaces in a quaint setting. You can expect that here. Right here. One part of this community as nearly all condominiums. Expensive condos! And it's worth it. This one is truly a sight to behold.